Molly Huddle seeks her second consecutive .US National Road Racing title at the USA Running Circuit (USARC) 12K championships Sunday morning in Alexandria, Va. A win at the 12K race would lift Huddle, with 45 points in the cumulative standings for the series of 12 races, ahead of current leader Sara Hall, who has 47. On the men’s side, Christo Landry will claim the series crown, since the only runner with a mathematical chance of beating him, Tyler Pennel, will not be racing. 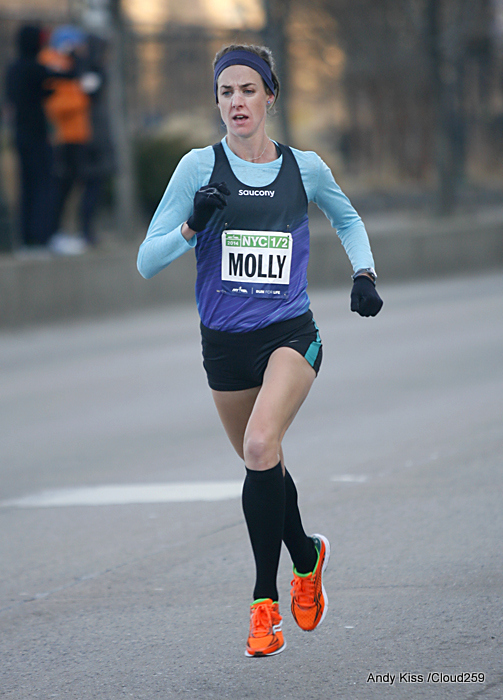 Huddle, who beat Shalane Flanagan at the 12K last year to claim the 2013 series title, is the clear favorite, though Hall has shown good form with recent wins at the EQT Pittsburgh 10-miler (53:47) and the Healdsburg Wine Country Half Marathon (1:12:54). Kim Conley, who finished fourth in the race last year and who is ramping up in mileage as she trains for the half marathon championships in Houston in January 2015, will also be racing. Huddle set the world record of 37:50 for the rarely run 12K distance last year, with Conley in fourth at 39:29 and Hall in sixth at 39:54. It will likely be tighter among those three this time. Given that the winner gets 30 points, a number of women could potentially claim the title should the favorites slip. Though the overall winner of the men’s series has been decided, the men’s race should still be a good one, as Landry looks to knock off the race’s defending champion Aaron Braun. After blistering the USARC series with three wins earlier this summer, Landry ran a 2:14:30 for 13th overall at the Chicago Marathon. The race will be broadcast free online via USATF.tv. The women’s race starts at 7:15 a.m. EST and the men’s race starts at 7:30 a.m. EST. Unlike recent broadcasts of the major marathons in the United States, coverage of this event will likely focus on the race itself, with minimal distractions and (hopefully) no outages. In other words, it will suit fans of the professional U.S. running scene. As a NASCAR fan, I need to know all the scenarios.